EP900 Series – Gaska Tape Inc.
Gaska Tape’s EP900 Series is a medium density closed-cell Polyvinyl Chloride foam. Previous testing of a high quality, die cut part (shaped for use as an ear plug) of .780” thickness and 0.53” diameter resulted in an average NRR rating of 31.3 when measured from 125 to 8000 Hertz (five subjects, average of nine hertz readings [Mean-2 times Standard Deviation]). Flexes to protect irregular surfaces. 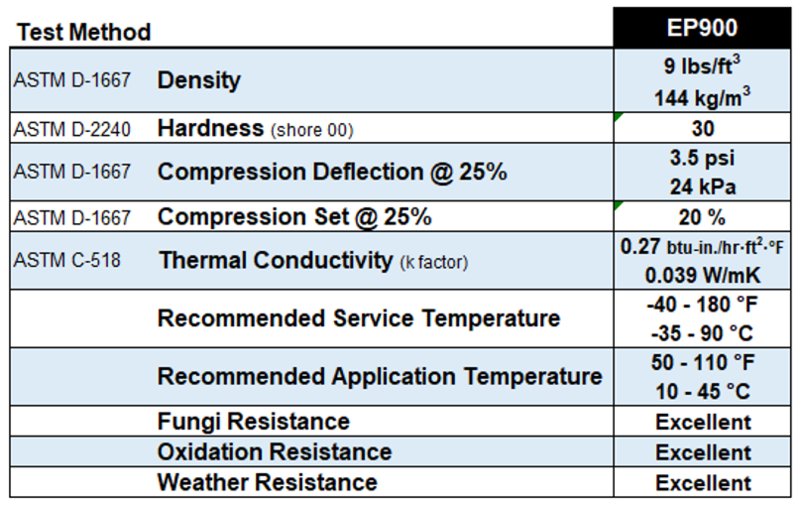 EP900 Series is provided in sheet form. Roll form is available in 0.500” thickness and under. Adhesives can be applied upon request. EP900 is cast on a 7 mil clay coated paper for a smooth surface. NOTES: The EP900 Series is a specialty product that will be quoted upon request based on thickness, width, volume, color, and application.